People have been collecting and buying art for centuries, from Italy’s Medici family during the Renaissance to modern day celebrities Beyonce, Angelina Jolie, Brad Pitt and Leonardo DiCaprio. But, you don’t have to have wealth and riches to collect and buy art that you love. 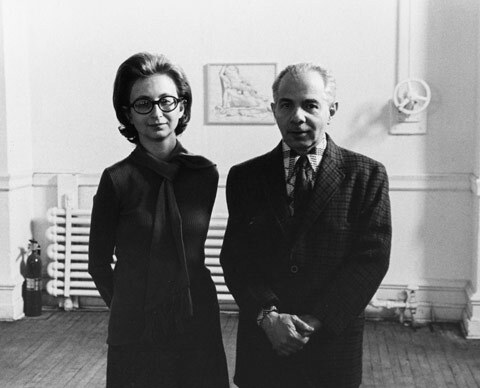 You may have never hear of the American couple Herbert and Dorothy Vogel, who lived in a one-bedroom apartment in New York and in the 1960s began buying art. Herbert worked nights as a US Postal clerk. Dorothy was a librarian for the Brooklyn Public Library. Dorothy and Herbert Vogel at The Clocktower with a drawing by Philip Pearlstein behind them, 1975. Photograph by Nathaniel Tileston. © Nathaniel Tileston, 2008. The couple lived frugally, they used Dorothy’s income for living expenses and they used Herbert’s income, around $23,000 annually, to purchase art! They did not purchase art for investment purposes. They personally liked the art and wanted to live with. The artwork was small enough to carry home on the subway or in a taxi. The Vogels amassed a collection of over 4000 works that included famous artists Roy Lichtenstein and even Christo! In 1992 they donated their collection of artwork to the National Gallery of Art because it charges no admission and they wanted their artwork to be available to the public. Even though the Vogels did not have The Internet in the 1960s, The Internet has made collecting and buying art accessible to people all over the world! Unlike traditional art galleries, which rarely label artwork and force you to summon an art gallery employee, who may or may not judge you to be worthy of the purchase! Art online is focused on the consumer with clearly labeled information about price, size, and includes details about the painting and the artist. Buying art online is easier than ever. Anyone who would like to hang something they love on their walls of their home or office can now buy directly from an artist's webite, saving time, money and hassle! Want to add some beauty to your living space for free? Receive a free 5x7 inch downloadable pdf of this painting. Print it out, add your own frame and Voila! You have instant art for your home or office space.